The Piotroski value stock investing strategy exists as a pre-built screen in the Uncle Stock fundamental stock screener. It uses market cap criteria and applies the Uncle Stock implementation of Piotroski's score to the Price/Book value ratio. 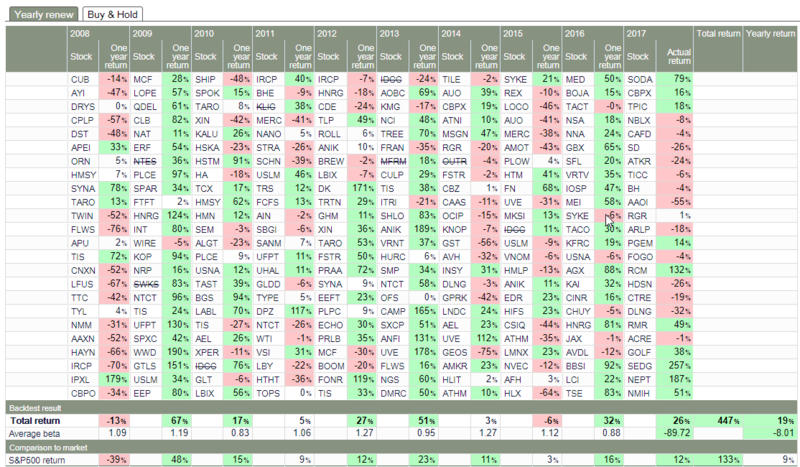 Back-testing the pre-built screen across all 46 of the included markets results in an impressive 29% CAGR. The only problem, of course, is we cannot take advantage of investing across 46 markets. A maximum market cap is included to exclude super-cap stocks. Not really an issue since the strategy generally performs better on smaller cap stocks. So, we will use the Uncle Stock pre-built strategy to create variations for several markets and back-test to see if they seem reasonable. If you are not familiar with the score components, they are explained in detail here. The key to this strategy is the Piotroski score. Nine financial criteria are identified which together create a score from 1 to 9. If a company meets a metric, it gets a 1; if not, it gets a zero. The more criteria that are met, the higher the score. The score is predictive of future performance. Uncle Stock has enhanced the scoring system to create a continuous score from 1 to 9. Now you can differentiate between companies scoring an 8 because they no longer get just an 8. They may get an 8.17 or an 8.79, for example, based on how well they meet each specific metric. In any case, ranking by the Piotroski score is multi-factor ranking. We will follow the basic steps to define your strategy for Piotroski using the Uncle Stock version of the scoring system. First, the market is set to US and the minimum daily trading liquidity is set to US $500,000. The default portfolio size of 8 is retained. The Uncle Stock Piotroski ranking system is retained. For holding period, we will use the 1 year default of the Uncle Stock back-test. The resulting CAGR is 12% - not quite as good as 29%. NOTE: Adding trading liquidity minimum to the default criteria had no effect on the back-tested CAGR. The nice thing about back-testing is the immediate feedback about how well something has worked in the past. Baseline historical performance of 12% may be better than most mutual funds, but the back-test feature allows us to look at other ways to approach this strategy. In fact, the most obvious is replacing the Price to Book valuation ratio with another valuation ratio. Next, several valuation ratios replaced Price to Book and were back-tested. Price to Book < than the 5 yr company Price to Book produced a CAGR of 13%, slightly better than the baseline. Gross Profit to EV (Enterprise Value) compared to 125% of the 5 year company average and EBITDA Yield compared to 125% of the 5 year company average also tested out at 13%. EBITDA is earnings before interest, taxes, depreciation and amortization. A similar test using Revenue to EV yielded 12%. Even better, Free Cash Flow to EV compared to 125% of its 5 year historical average resulted in a CAGR of 15%. So, just trying 5 variations and back-testing led to an improvement of 3% per year in performance. That is a huge improvement when compounding total return. Using dividend yield, the strategy produced a back-tested yield of 17% as shown in the detail below. In addition to yield, for this variation of the strategy payout ratio was added as a criteria and limited to 30% to ensure quality. But, the devil is in the details. Are there enough passing companies in each year. If you cannot fill up the desired number of positions in your portfolio, something needs to be done. This works. Plenty of stocks in each year. The search for an alternate value continued and led to screen shown below using the PEGY ratio (the PEG ratio that includes the yield). A simple screen with multi-factor ranking that back-tested to a 19% CAGR as shown in the details below. And every year had 24 stocks to choose from. NOTE: A ticker with a line drawn through it means the stock was used in the back-test but no longer trades in the US Market. But any strategy must work in the market where you trade and invest. With that in mind, the PEG ratio strategy was back-tested in a variety of markets. With excellent results in every case. Note, however,on occasion there were some short-falls in the number of passing stocks. For example, Canada had only 2 passing companies in 2008 and India had only 6. In every other year, there were enough passing companies to meet the portfolio requirement of 8. Japan had only 1 passing company each year through 2016. Uncle Stock explained that historical data for Japan is currently being added and is not you complete. Clearly this will not be a viable strategy in that market until the historical data is updated. Lots of possibilities here - both the dividend yield/payout ratio and the PEG ratio variations show lots of promise. And the back-test capability lets you try out your ideas. BUT, the importance of checking the details of the back-test cannot be over-emphasized. 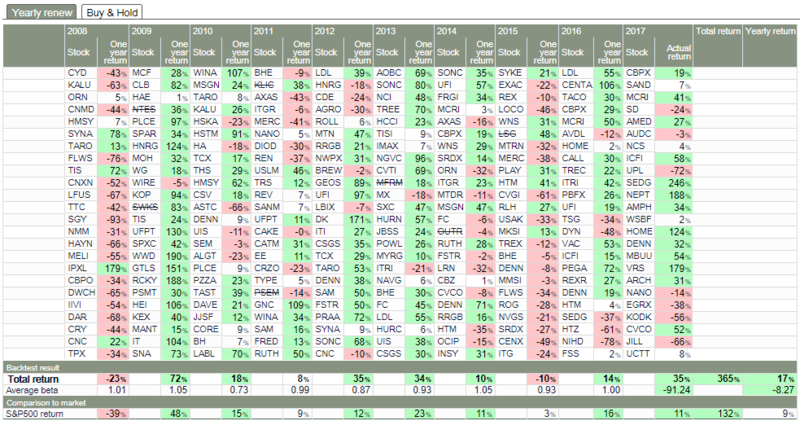 If you decide to take a test drive at Uncle Stock, a custom Piotroski value strategy from their pre-built screen is a great way to become familiar with this stock screening tool. And build a great custom strategy in the process.